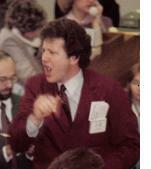 Jeff Quinto is a 40-year veteran futures trader and a world-class trading coach. He has coached hundreds of electronic traders, including traders from Hong Kong, France, Slovenia, England, Australia, the US and Canada. Jeff strongly believes that professional traders are world-class competitors, comparable to professional golfers, top tennis players, and Olympic athletes. None of these competitors could have achieved their top-ranked status without first having a world-class coach. 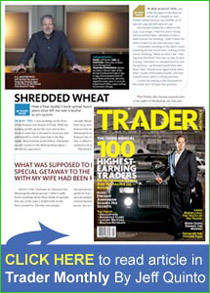 Jeff’s entire career has been spent in the futures business, first as a stockbroker and commodity specialist with Shearson and, later, as a trader on the Kansas City Board of Trade floor where he traded wheat and stock index futures. His company, Jeffrey S. Quinto and Company was a clearing member of the Kansas City Board of Trade and a member of the Chicago Board of Trade. In the nineties, Jeff served as President of Rand Financial Services, a large Chicago-based futures clearing firm owned by the Trout Trading Fund. 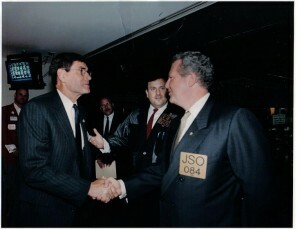 During this period, Jeff did business with some of the greatest futures traders in the world. From 2000 to 2005, Jeff was responsible for training traders at an all-electronic proprietary trading firm located in Chicago and Vienna, Austria in which he was a partner. Today, Jeff coaches Professional Trader Mentorings from around the world in his Professional Trader Mentoring Program. Mentoring these professional traders is the exciting and rewarding culmination of his career in futures. It would be hard to find anyone with Jeff’s extensive, long-term successful background in futures trading who coaches traders. Jeff has a Bachelor of Arts degree in Management from Webster University where he was honored with two academic awards upon graduation. He attended the Rockhurst College Executive MBA Program as an Executive Fellow. In 2015, Jeff earned a Master of Divinity degree from University of Dubuque Theological Seminary, a Presbyterian Seminary. Jeff was a member of the Chicago Mercantile Exchange and served on the CME’s Membership Committee and its Clearing House Committee. Jeff was a Market Education Speaker for he Chicago Mercantile Exchange and, in 2009 and 2010, was a Lecturer at Northwestern University’s School of Continuing Studies. Jeff splits his time between coaching professional traders and various non-profit interests. He serves as Executive Director of the Adult Christian Education Foundation, Inc, better known by its sole ministry, The Bethel Series. Jeff is a member of the Advisory Board of the Children’s’ Brittle Bone Foundation and serves as President of the Wisconsin Chapter of the Association of Lutheran Development Executives (WALDE). Jeff lives in Madison, WI and has four grown children and six grandchildren.